Life can be exhausting. Life can be challenging. Life can be messy even disastrously messy at times. If we are honest with ourselves, social media has made too many women feel inadequate in many areas of life. Mommas need lots and lots of grace. JESUS HELP US! You know what we’re talking about – the perfectly dressed kids that are all smiles (that took way too many photos to capture), the delicious Pinterest inspired home cooked meals (that don’t mention that your children will not eat this food), the amazingly clean and trendy looking homes (that have loads of laundry just out of photo shot), and the flawless skin and hair (thanks to the many filters that can make us look like a different person). It’s such a lovely facade that can make most moms feel inadequate and even a bit envious. We ask, how in the world do these moms find the time and patience to do it ALL? The perfect woman only exists in highly filtered images. The reality is most days are filled with tantrums, fighting, and attitudes by the picky bossy little humans that we created. 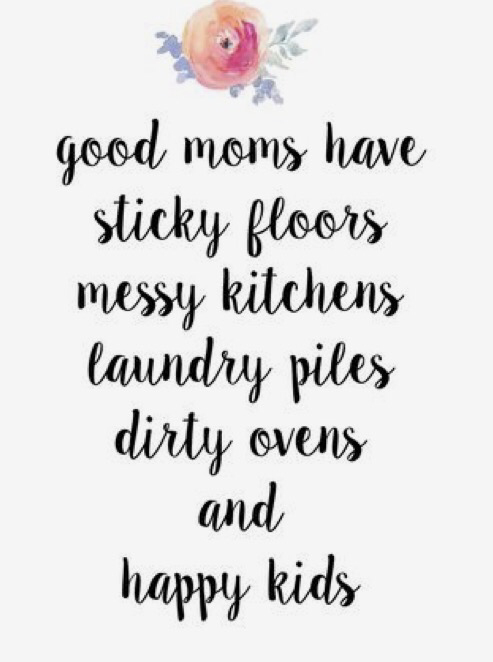 That doesn’t mention the countless hours we spend cooking, washing dishes, laundry and cleaning. Lots and lots of cleaning. We’ve spent more nights then we would like to admit exhausted and in tears because we don’t feel we’re doing this “mommy life” right. We get frustrated and overwhelmed. We lose our patience. We get angry because we haven’t eaten all day, or we haven’t been able to take a shower yet or we just want ten minutes to ourselves. Does this sound familiar? We hope we are not alone. Going from 2 to 3 children was my biggest challenge thus far. I am absolutely blessed and love my babies more than anything but the reality is IT GETS TOUGH. I am certain that it DOESN’T get easier as time goes on. The challenges change but the struggle is just the same. You know I feel a sense of guilt admitting all the struggles I face but there is so much freedom in this truth. There is this sense of guilt from showing my weakness and my struggles. This is not the popular road to take but I believe I am not alone in these feelings. People like to see the beautiful well put together family. The white picket fence with a happy husband and wife and 2.5 kids. Oh and don’t forget the dog. I don’t know how many times we have been out recently with all 3 babies and the smiles we receive from strangers. The compliments on the beautiful family we have. “Two boys and a baby girl?! You are so so blessed.” I laugh to myself because they didn’t just see the struggle and argument to get the kids ready and out the door or the attitude because we didn’t buy the toy they wanted. So I smile because our biggest headaches are also our biggest blessings. There is so much freedom in believing and realizing that its ok to not be perfect and always well put together. Our children are a blessing even when they don’t want to smile for a photo or behave at the store. Moms, it is ok to admit that we have hard days and struggles. It’s ok to show the “other side” of our perfectly timed photos that are shared on social media. It’s ok to not always be the picture perfect “post worthy” family. I am still fairly new at momming. My eldest just turned four and I have a long road ahead filled with new parenting challenges as my children grow and mature but I believe that some struggles will remain. One thing that remains is me. I am learning how to balance and make time for myself. Sound a little selfish? It’s not, because I need it. It’s funny I used to feel so guilty working all day and then taking time for myself for simple things like a pedicure. So I would squeeze all the “me time” that I could into my lunch breaks so I wouldn’t be away from my babies once I got home. Now that I am home with my babies all day I STILL feel that guilt of taking time for myself. But we need it mommas. For the sake of our children, husband and our own sanity we need some time of refreshing and refocusing. Are there any mommies that can relate? Soul Care & Self Care are so important. We cannot pour love and grace into our spouse or our children, until we first have poured into ourselves. When we are running on empty our entire family is impacted. We compiled a list of our tried and true tips that we can incorporate into our schedule with a little practice and intentionality. 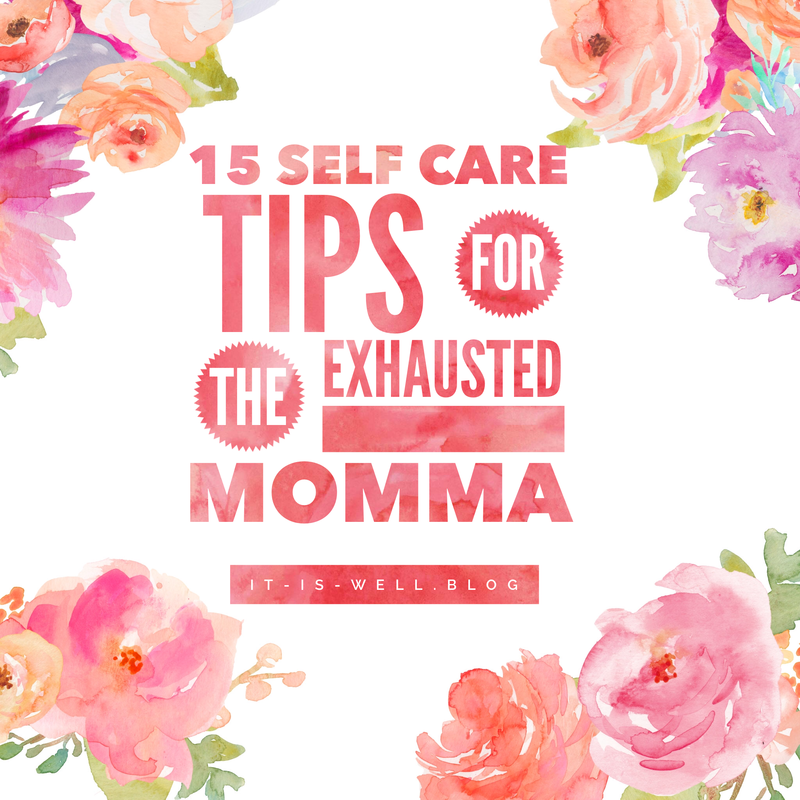 Mommas, we set the atmosphere of our home so let’s strive to fill ourselves up without adding a bunch of items our already busy day. Of course there are the obvious pampering sessions that will restore the weakest of souls such as getting your hair done, manicures, pedicures, facials, massages, etc. Our list is for the in-between time where we frequently live. Prayer & Meditation: Find yourself some quiet time with God. Stay in communication with Him all day. First thing in the morning – give your day to God, while doing dishes – listen to worship, while folding laundry – lift up your family, give thanks and give praise continually. We do not need to be on our knees or in a special place of prayer (these are good things but not always feasible every day) to be in communication with God. So cling to Him and use some of your common everyday tasks as a reminder to speak with Jesus. Wake-up First: When we are the first to wake up before everyone else and enjoy a cup of coffee or tea in silence all is right in the world. The atmosphere in our spirit and home is created by peace and prayer. This isn’t always possible since I have an early bird child but when it is, it’s glorious. Happy Hour: Turn off the TV, music, and don’t forget noise making toys. We call this hour of silence our happy hour because silence helps quiet all of our souls. Aroma Therapy: Different scents impact our moods. So diffuse some lavender oils, put on some quiet music and get to cleaning. Set the atmosphere in a new way. I recently discovered the use of essential oils and it has blown my mind. I am so excited to share more about this in the coming days. Dance it Out: Children have their own personalities and sometimes those personalities clash. This can cause tensions to get high and tantrums to explode. When you see the signs, it’s the perfect time to step away from whatever you find your hands doing and take a break – EVERYONE! Start a dance party, a sing along, a walk around your yard, something to get everyone’s focus on something new. The task will still be there but odds are you will get fewer interruptions when everyone has had some fun time and you may even prevent a meltdown. Balanced Diet: As much as I wish it was possible, we cannot live by coffee alone. Mommas we need to eat to, so feed your soul and feed your belly. Eat more fruits and vegetables to help fuel you with the natural energy you need to run a home. Sleep: Because scrolling through your feed at 11pm isn’t doing your body any good. Get rest when you can while you can. To Do List: Focus your thoughts. Write down your to do list the night before. This will help you get a head start on your day by ending your night worry free and beginning your morning with a game plan. Simplify & Organize. I recently heard a pastor say God is not glorified in your mess (and boy can I have a mess). The less clutter in the home the less clutter in our minds. Less clutter means less time to clean up. I’ve been posting items on some selling apps and slowly removing clutter from our home and it feels oh so good. Self Growth: Read your bible and another book. It can be about motherhood, marriage, serving Christ, a hobby you want to develop – anything to push and challenge you to grow. Do you sit in traffic all day? Audio books, podcasts and apps are a great way to feed your souls during that time. I spent countless hours in traffic before I became a stay-at-home mom and audio books are amazing. I still use my apps from my favorite pastors during the day while cleaning because I enjoyed them so much when I was a commuter. Feed yourself because a well-fed soul can feed others. Connect Groups: We need each other. Friendship is an important aspect to our spiritual health so be involved with a group of women that will walk along with you and cheer you on. Women who will pray without judgement and speak life into your situation. Play dates: Get those children out of the house and get yourself out of the house. You all need to fellowship time. Minimize Your Screen Time: We cannot believe everything we see on Social Media. If you’re like me my house is NOT picture worthy clean 99.9% of the time but I’m not going to post a picture of my mess. Remember perfect pictures do not mean perfect homes or perfect life. Put down your phone, let go of the comparison and enjoy the moment that you are in now. We do not propose that you try all of these today, but we hope that some of these tips will help you find some calm in the midst of chaos. I believe that we all want to strive be the “better” moms for our children. Lets strive to be a happy and healthy mommas as well. Together, let’s lay down the guilt and pick up the grace of Jesus. Happier & healthier (spiritually and physical) mommas are better moms. Our children love us. We are their world so just know that even when we don’t feel perfect that they love us just the same. 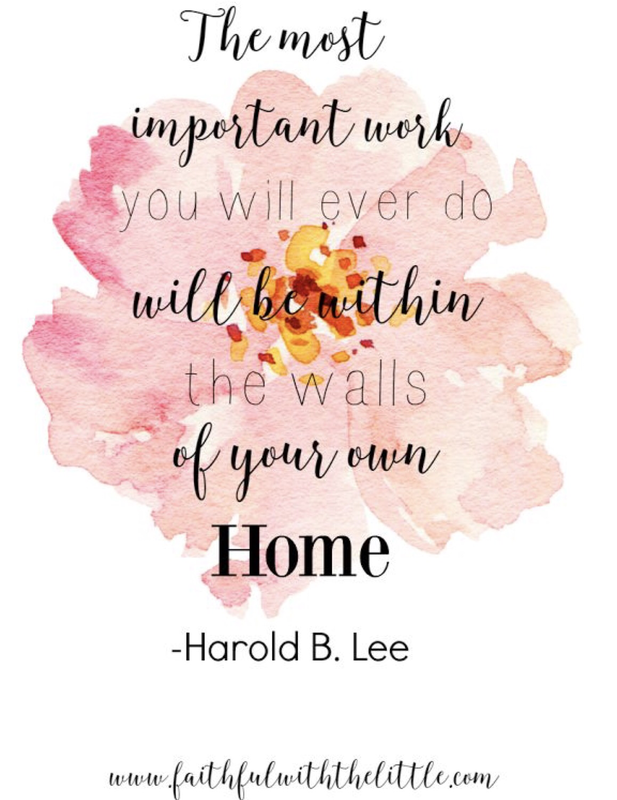 That quote by Harold B. Lee is so true! I believe the enemy knows this and tries so hard to get us moms distracted and discouraged. God blessed us so that we can bless our children… and then they, in turn, can bless others. It is such a beautiful gift. I love the tips you have on here! #14 is so true! I think we need to be real with ourselves and lower our expectations (of ourselves, our kids, and our plans). Thanks for sharing!